This is one of those ‘you’ve made it’ statements. 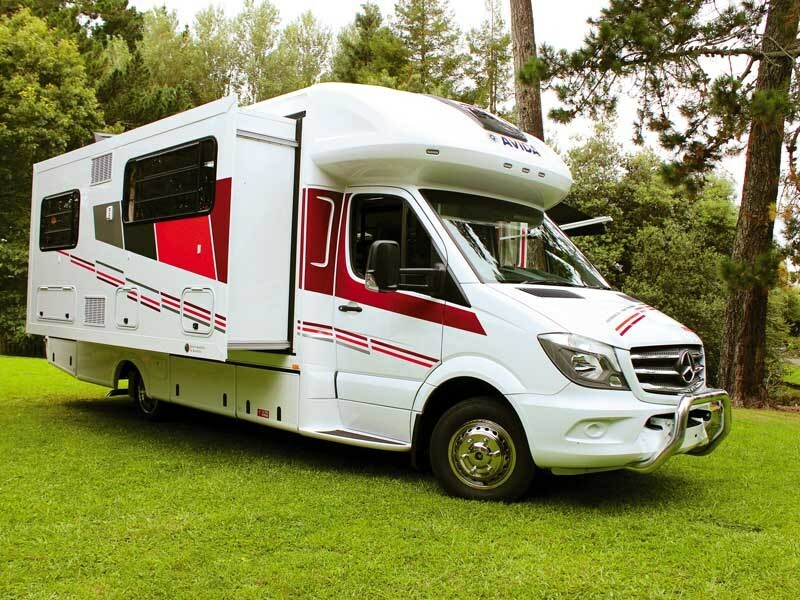 As far as opulent offerings in the motorhome market go, the new Avida Torquay is definitely up there breathing the rarefied air of the best on offer. 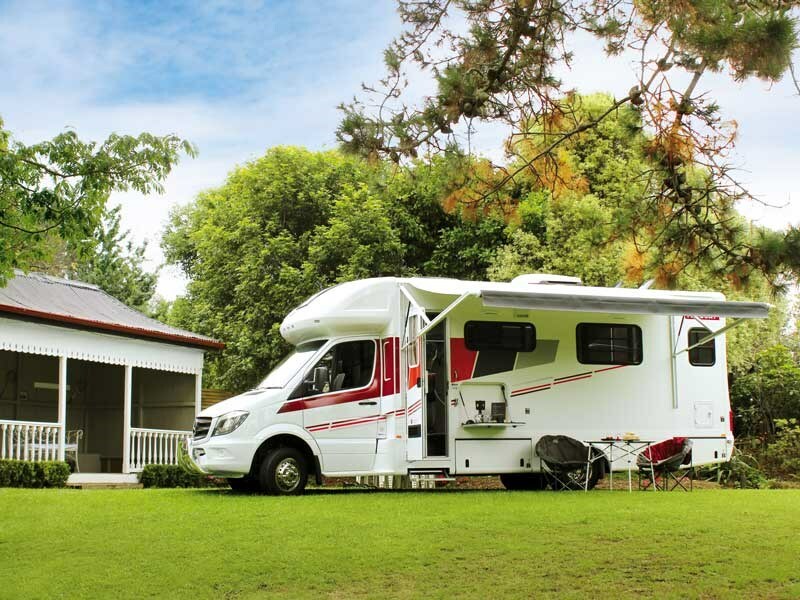 Australian manufacturer Avida has been turning heads of late with its rather excellent Emerald and Topaz caravan models. Not known for scrimping on the details, Avida pulled out all the stops when putting these range-topping ‘vans together; the results speak for themselves as you’ll see if you walk your fingers through your stack of MCD back issues and find our reviews of each. 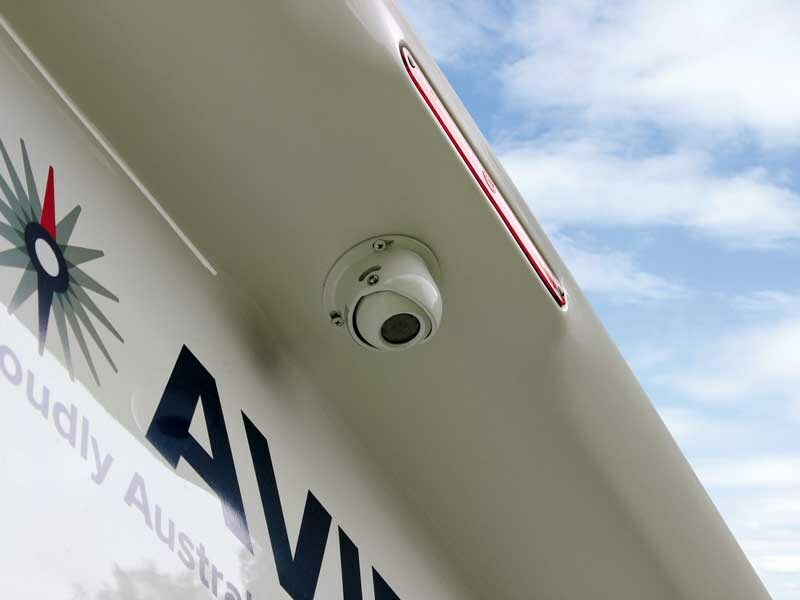 New Zealand distributor Auto Leisure & Marine brought examples of these top-notch tow-behinds into the country last year, creating plenty of positive buzz in the process. 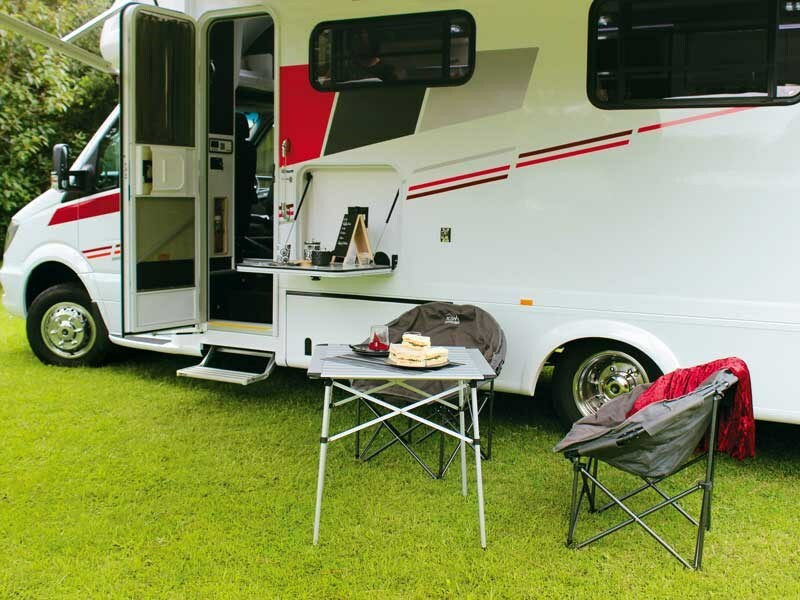 Now though, the same fit and finish attributes that set the Emerald and Topaz apart have been reborn in motorhome form. 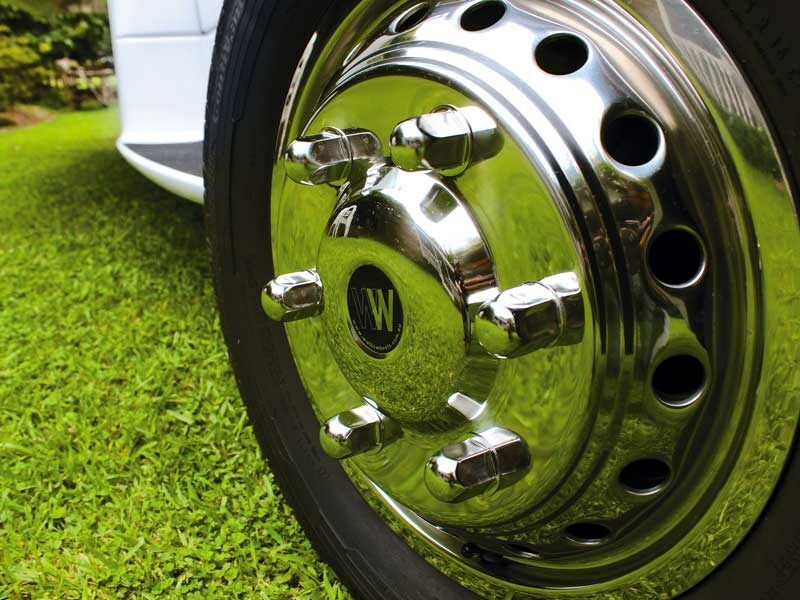 The manufacturer listened and the Torquay features many of the attributes the ‘vans showcased. One of the most notable updates is the gloss finish interior wall and ceiling panels. If you’re thinking gloss white might translate into minimalist starkness, think again. Rather, the gloss white look is both modern and welcoming. If it’s texture you’re after, a subtle pattern in the east-west end walls—separating the driver’s cab from the main living area at the front and the bedroom from the bathroom at the rear—feature subtle patterns, which reveal themselves in certain lights, breaking up the smooth gloss finish nicely. Mind you, the gloss look is almost at its best when used expansively. There is so much storage space in here and with a uniformly flush finish for all cubbies, interior surfaces look crisp and premium as a result. The benchtop in the kitchenette is also a new feature for Avida; a concrete-look surface which, again, isn’t as austere as you might be imagining. Rather it looks like the interior of a modern apartment cut from the pages of a high-end design magazine. Contrasting leather upholstery throughout the interior completes the look and is another new feature for 2017. Although there might be four seatbelts on offer, all this living space is for one very lucky couple. And once the lengthy slide-out is deployed, that living space is truly admirable. Entering amidship, the feeling of space is apparent from the get-go. The dinette features deep sofas with an adjustable and removable table in between. Remember, these sofas aren’t called upon to provide back-up sleeping accommodation, so there is no compromise on comfort. 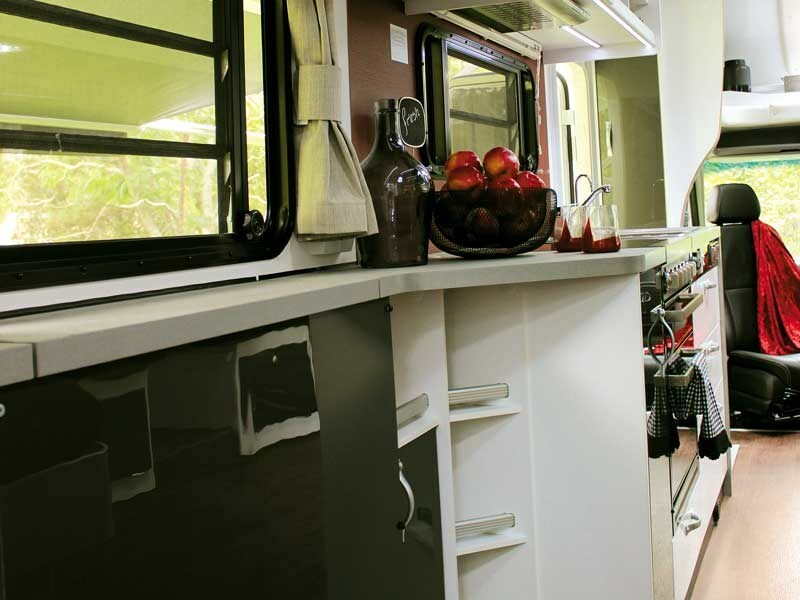 To the right of the dinette, towards the rear of the motorhome, sits the 190-litre fridge freezer and microwave stack, which in turn separates the living from the sleeping area. This entire wall length—including the generous queen bed—forms the slide-out portion of the Torquay. A simple push-button frees up a vast amount of floor space, which means transitioning from the driver’s cab at one end (with conversation-friendly swivelling chairs) to the bathroom at the other end is a breezy walk rather than a narrow zig-zag past low-slung protruding cabinetry. As the Torquay is designed with co-habiting couples in mind, there’s also more storage space above the cab rather than spare sleeping quarters. The Torquay’s kitchen and bathroom facilities are, as you’d expect, absolutely first-class. 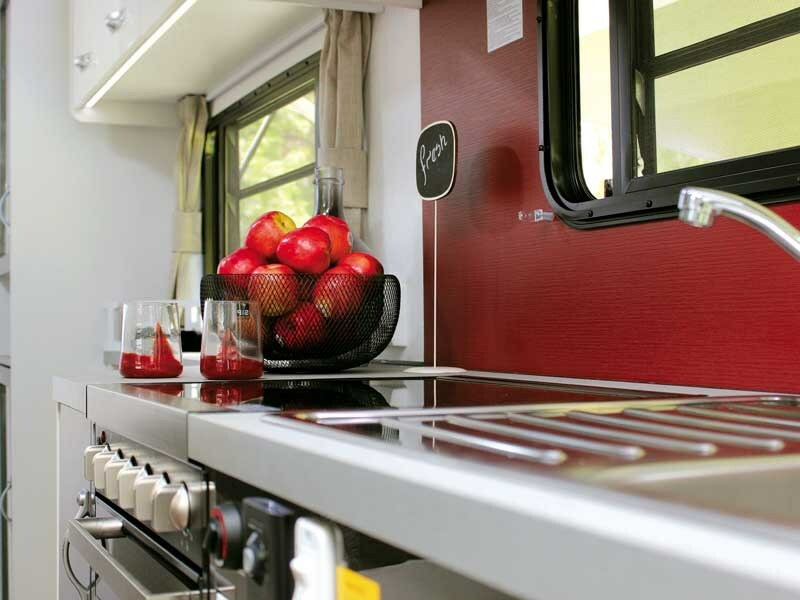 The kitchen benchtop is roomy and features an extra pull-down prep surface. Drawers are deep and plentiful. There’s a dedicated wine rack, which sits behind tasteful smoked glass. If you’re a white wine aficionado exclusively, this can be swapped out for a wine cooler. 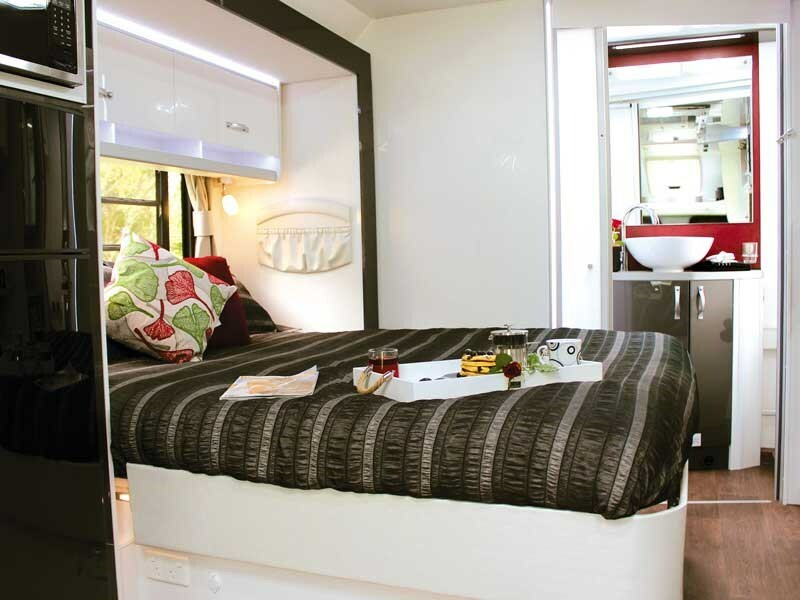 Staying with this side of the motorhome, the cabinet opposite the bed features shelving for books and other items, with provision for a flat-screen TV to rise out of the cabinet when required. A second TV can also be optioned and connected inside a covered nook in the exterior wall of the Torquay, for movie-watching under the stars (or the automatic fold-out awning at any rate). 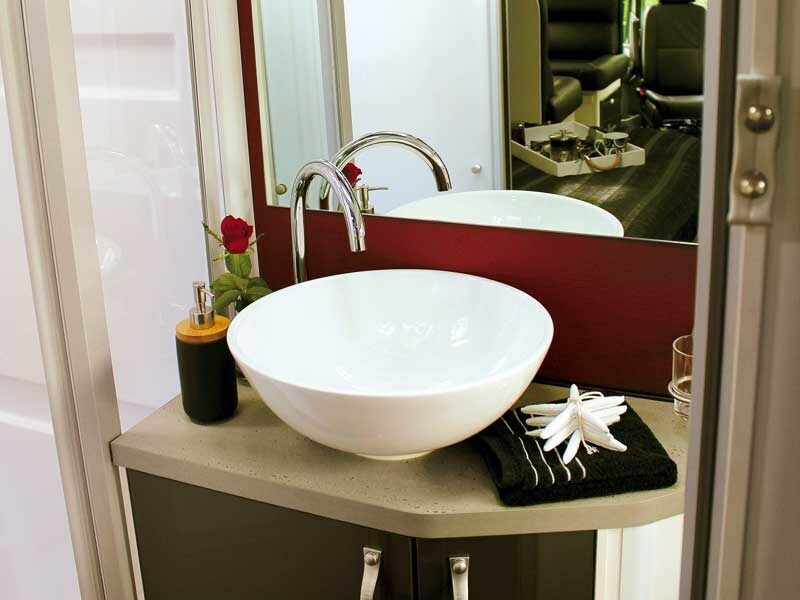 At the rear of the motorhome, behind a modern-looking white panel door designed to match the high gloss elements elsewhere throughout the Torquay, sits the bathroom. Even without the lights on, it’s impressive how bright this area is. A decently-proportioned shower sits on one side, porcelain toilet on the other, and ceramic basin above a full vanity in the middle. 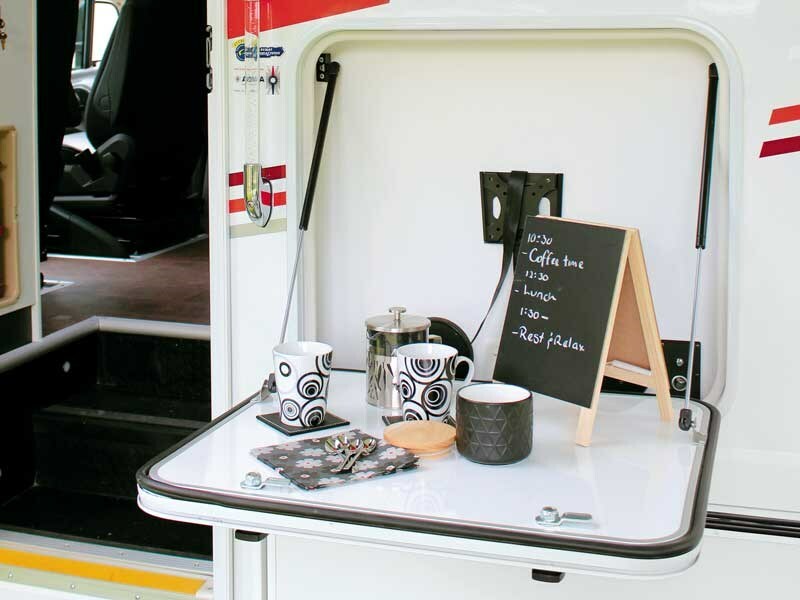 With its inbuilt shelving, hanging rail, large mirror, venetian blind, and other details, this wee hideaway effortlessly matches the modern ambience exhibited throughout the rest of the motorhome. You have 100-litre fresh and grey water capacity aboard, as well as an external hot and cold shower connection for de-sanding after that beach swim. Well, with an interior this luxurious, you won’t want to track sand through it. The power underneath the passion? It’s a Mercedes-Benz Sprinter 519, featuring a gutsy turbo diesel engine (torque-y of a different sort, if you’ll pardon the pun) and a comfortable cab with a roomy driving position. The Torquay isn’t insubstantial at over eight metres long, but big mirrors and a standard reversing camera help with visibility. Satellite navigation is also standard here, so every backroad can be confidently explored. And with an eye for detail, even the driver and front passenger seats are colour-coded to match the upholstery in the living area. Torquay is an absolute winner from stem to stern. It features possibly the best interior I’ve seen in the last six months; a haven of modernity with premium-feel accessories at every turn. I’m really impressed and, I’ll admit, just a wee bit envious of lucky couples with this on their ‘must-have’ list. For further information, call Auto Leisure & Marine Group on 07 850 5512. Thanks to Woodside Estate (woodsideestate.co. nz) for our photo shoot location. Check out the video tour of the Avida Torquay here.